The TwK™ 88 is a state-of-the-art digital signal processor engineered to deliver world-class system tuning capabilities in an easy-to-use format. 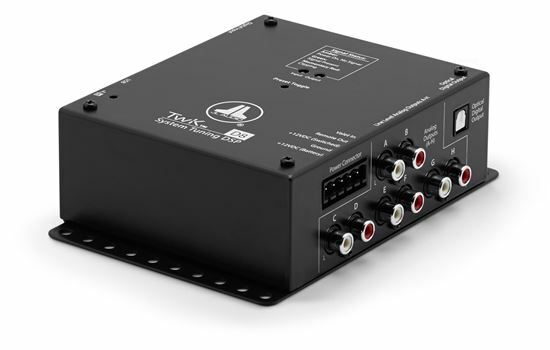 The TwK™ 88 is a state-of-the-art digital signal processor engineered to deliver world-class system tuning capabilities in an easy-to-use format. Equipped with an advanced 24-bit DSP processor, the TwK™ 88 includes flexible input/output options, 80 total bands of equalization and powerful mixing tools. The included DRC-200 Digital Remote Controller offers dual level controls, toggles up to six presets, and has an LED indicator. Control the TwK™ 88’s entire feature set by connecting it to your PC via USB, using the companion TuN™ Software interface. Flexible input design with 8 differential-balanced, line-level analog inputs (RCA), accepting line-level signals up to 7.1V (RMS). Separate optical (Toslink) and coaxial digital inputs for connection to digital S/PDIF sources. Flexible input mixer allows input channels to be combined with full control over each input’s level and polarity. 8 banks of 10-band graphic or parametric equalizers with configurable EQ assignment. Powerful crossover section with fully variable, high-pass and low-pass filters, crossover slopes are selectable from 6 dB/octave to 48 dB/octave (in 6 dB/octave increments). Configurable polarity and delay settings, with separate entries for speaker distance plus offset control fully linkable with other channels, in any combination, for adjustment. Precise output level controls, adjustable in 0.5 or 0.1 dB increments, fully linkable with other channels, in any combination. 8 analog, line-level RCA output jacks (4V RMS). Optical (Toslink) output jack provides a pass-through digital audio (S/PDIF) signal from any pair of input channels, with no signal processing applied. Remote turn-on output (+12VDC) for activating aftermarket audio equipment. JLid™ Port allows connection of the included DRC-200 Digital Remote Controller to add dual configurable level controls, preset selection and LED status reporting from the driver's seat.